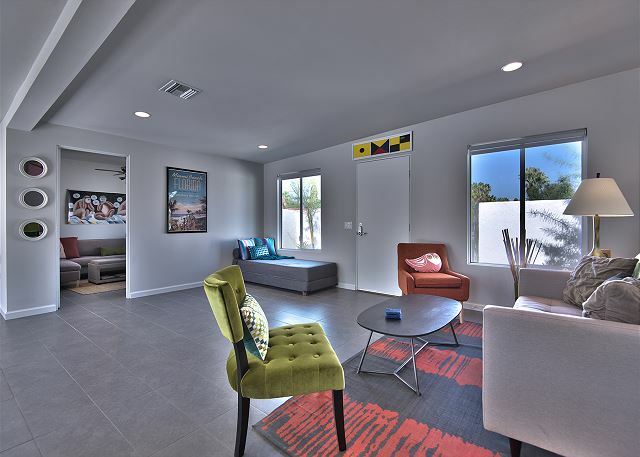 This 3 bedroom, 2 bath house has been totally redone and is newly on the rental market. The house has a fun and modern vibe, and all the amenities you expect to find in a first class vacation home. The house features an open great room, with the new, fully-stocked kitchen open to both the living and dining rooms. It's a perfect way to gather your family and friends together to cook, eat, or enjoy a game. The large master suite opens directly to the pool and has amazing views of the beautiful mountains, as well as a large, en-suite bathroom. 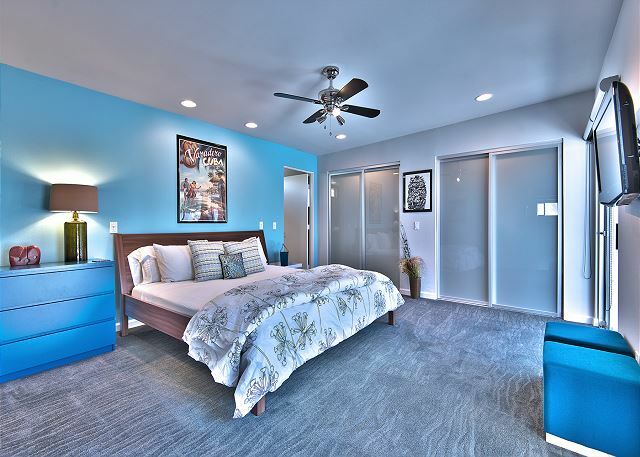 The two guest bedrooms, each with it's own flair, are both spacious and bright, and share a bathroom. The house also has a separate TV room with a large HDTV. 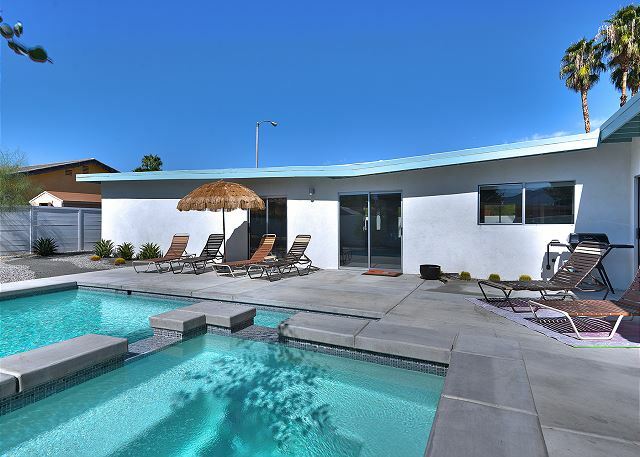 The new pool and spa offer you the perfect spot to enjoy the Palm Springs weather and enjoy the beautiful mountain views. 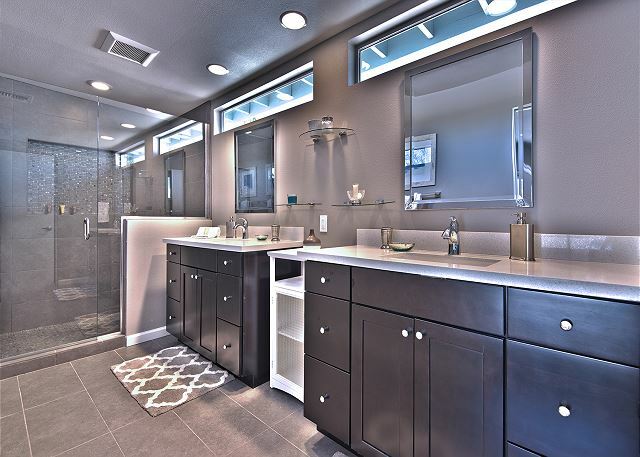 Just a few minutes from downtown and the airport, and right next to Mesquite Golf and Country Club, this affordable and well appointed home has it all! Overall we were very satisfied with our stay at Sunny Dunes. Quite and relaxing with a nice pool and spa. The rental experience was amazing and we enjoyed the time we spent and the home was wonderful. This place is truly lovely. Modern, quite fancy and well accessorized/equipped. They have a pool, hot tub, nice bathrooms, tv room with an xbox and board games, foosball table... and the kitchen is fully equipped. The thing is - it is actually a good $75-100 a night more than the listed price. It is an extra $30 for them to heat the hot tub and pool and then there's the Palm Springs bed tax and all kinds of other fees so what I thought was going to be $1200 for 3 nights turned in to $1490. They also have an extra fee for early check-in but were very nice to waive that for us, seeing as check in isn't until 4 pm and check out is at 10am. They have a binder of rules - and it seems like it's not the company's fault, its Palm Springs... no music outside, no TALKING of ANY KIND outside after 10pm or else you might get evicted... they're not particularly responsive once you've moved in and the phone rings 4 or 5 times a day with telemarketers. Other than that, it is a really cool spot. enjoy. Very nice spacious and updated house in a quite neighborhood, close to everything needed. This home was in great condition, completely updated, and most importantly great for our dogs.The only downside for the dogs was the lack of grass in the yard which was expected (the pavement and rocks were too hot for their paws). The pool was a little small but perfect for our family. Overall great stay! Very nice house, exactly as show in pictures. Check in was a snap and my contact was very responsive. My only small gripe is the rules are a bit strict. No music by the pool? Not even from a phone? A bit much, no? Other than that the stay was nice and many amenities (floaties for the pool, many poolside towels, xbox, new chairs and tables for the pool area etc). Our stay was everything we wanted it to me. 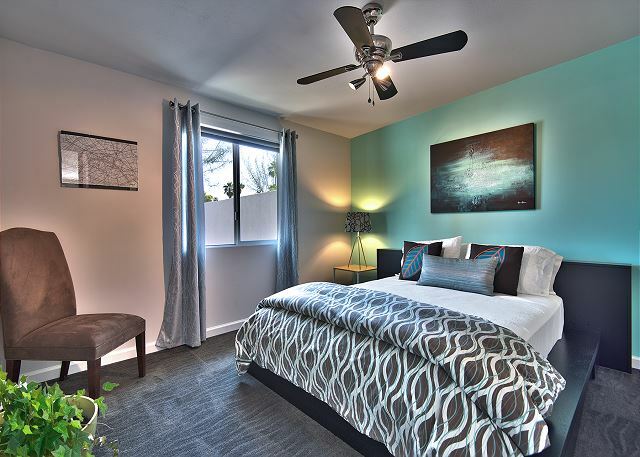 Spacious bedrooms, beautiful fully stocked kitchen, modern decor, heated pool and fenced in backyard. Perfect for our friends-gathering. Everything was spotless and well kept. Sunny Dunes was the perfect spot for a weekend meet up with four of my friends! The house was beautiful and the location was great. Communication with management was super smooth and check in/check out was a piece of cake. We would definitely stay again! Fun visit for our families to relax and get some vitamin D in before winter. We laid by the pool, while the kids enjoyed the pool. The house has a nice layout, great for entertaining or putting the kids into a separate space so kids and parents and enjoy their company without shouting over each other. The rooms are nicely decorated with comfortable beds. Property manager was great to work with, helpful and attentive!! [PT] Desde o processo de reserva at os ltimos momentos da estada, tudo foi exatamente dentro do esperado. A casa estava limpa e preparada para a nossa chegada, o processo de check-in foi explicado cuidadosamente e todas as instrues claramente comunicadas. A casa muito confortvel e muito bem localizada. Estar de carro necessrio, porque Palm Springs uma cidade bem espalhada, mas a menos de 10 min da casa h supermercados (Walmart, Target) e alguns fast-foods, que ficam abertos at tarde - ideal para festivais ;) Por fim, a rea da piscina estava limpa e bem cuidada, e foi um dos pontos favoritos da casa! [EN] From the reservation to the last minutes of our stay, everything went as expected. The house was clean and prepared for our arrival, check-in process was carefully explained and all instructions were clearly communicated. The house is really comfortable and pretty well located. Having a car is a must, since Palm Springs is very sprawling, but within 10min drive you'll find groceries (Walmart, Target) and some fast-food joints, open til late - grete for music festivals ;) Finally, pool area was clean and well maintained, and it was one of our favorite things about the house! This house was amazing. It has everything we needed and more, it was stylish, clean, excellent location. 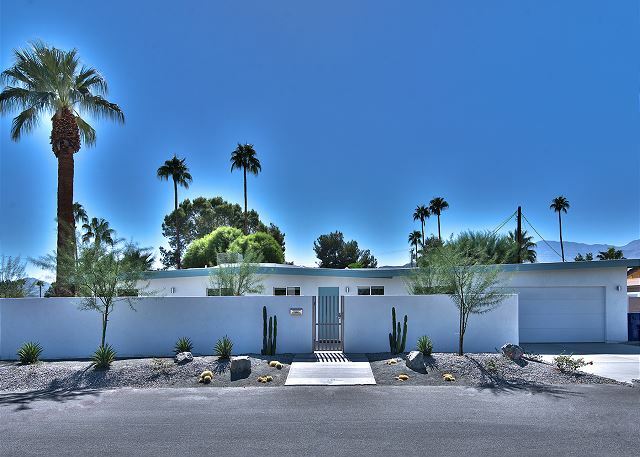 We loved staying here and experiencing our first time in Palm Springs in this house. Perfect place to stay only the chairs(beds) outside are old. Everything about this place was wonderful. My one suggestion is that the master bedroom install heavy-duty black out drapes. From 3p the sun beats directly into the room for hour 5 hours and the shades there now aren't enough to cool it. It stays extreemly warm for 12 hours following. Sunny Dunes was a nice & easy location for our 3 night stay in Palm Springs. Super close to the airport and surprisingly not noisy. Convienent to grocery stores and restaurants. Had to drive a short distance into downtown area but that was fine. Home was well appointed and had literally everything you could need. Things were clean and nicely decorated. Worked out great for my husband and I and two daughters 10 & 14 years old. Drove to Joshua Tree for one day, spent a morning at the Palm Springs Arieal Tram, some time in downtown PS and sunny afternoons and evenings in the pool which worked out great. Great location / Nice House! This house was in a nice location for our spring break trip and we all enjoyed the pool. The beds were comfortable and the kitchen had everything we needed on the days we chose to cook and eat at home. Great location...would go back again. We stayed at Sunny Dunes for a girls time away. It was a wonderful experience from the moment we opened the front door. The house was spotlessly clean and had every possible amenity we could dream of. The owners left no stone unturned. We also loved being able to park in the garage, an added bonus we were not expecting. I would highly recommend this property and will likely stay there again in the future. It is not far from downtown and it was a nice quiet neighborhood. Nicely appointed, wonderful pool and hot tub. Comfy 3 bedroom house was great for our trip! Sunny Dunes worked pretty well for our annual Palm Springs trip. The mgmt co was attentive when we needed them, and property was comfy. My only issue was that the kitchen was very poorly stocked. Houses that hold 6 people should have more pots, skillets, etc. Trying to prepare meals for a large group with such limited cookware was difficult. We wound up buying a large covered skillet while we were there. The kitchen supplies could use some additions and the knives need sharpening or replacing. Other than that, the house was adorable, clean, and comfortable. My girlfriend and I stayed at Sunny Dunes for 6 days. The condo was as described and amazingly clean. Amenities were excellent and the condo had an amazing layout. Due to some heavy winds prior to our arrival the pool was very dirty but the owners were extremely quick in having it cleaned. Great customer service. The hot tub was a great place to unwind in the evening and the kitchen was a great place to cook together. Wifi was very reliable and the use of the garage was an added bonus. Went to Palm Springs with a few friends for a little get away. 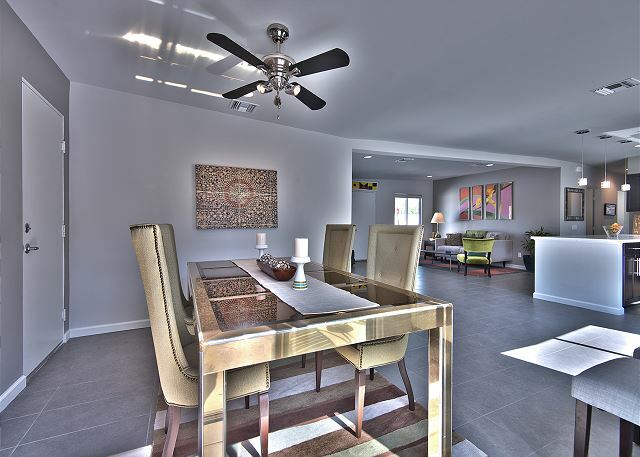 We were more than impressed with the sunny dunes home! It was clean, big and best of all check in was so easy. The home had everything we needed, all we had to bring was our own food. In the home we had a manual that listed everything we needed to know about the home. The manual even has listings of local shops. Over all we had a great time, wish we would have stayed longer. Will definitely rent again! Great house. Terrific location. Clean, spacious easy check in and check out. Beautiful remodel of the house, pool/spa have great views of the mountain. Would totally stay here again!! Michael from the management company was a dream to work with. Nothing like escaping to the desert for great times and relaxation moments. 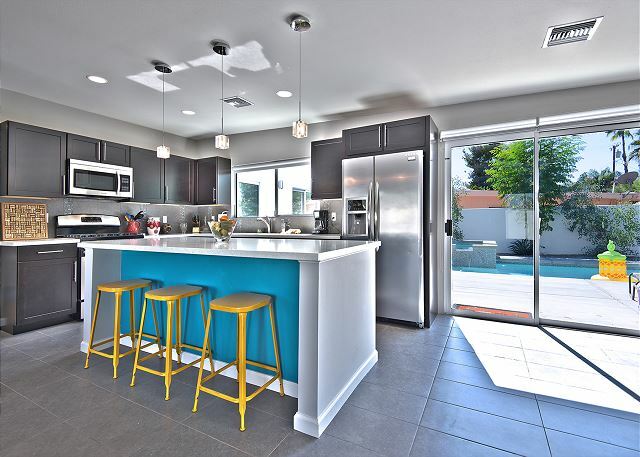 House has everything you need to to jumpstart a party or to float your days away in the pool. Had a great time and will look forward to staying in the future. I truly enjoyed this home. It was very comfortable and had everything we needed. The pool and jacuzzi were heated and so pleasant. I would have loved to stay a few more days. All the appliances in the kitchen were brand new as as the washer and dryer. Truly great experience, would love to come back again! My boyfriend and I decided to plan a very last minute getaway to Palm Springs for the weekend. We found this amazing house that we fell in love with it, we got a response from the owners ASAP. They were so easy to work with and answered all our questions immediately. The home was beautiful, fully furnished and most importantly VERY clean. It was in a perfect location, close by to everything. We loved the open floor plan and the backyard was the perfect size. We've stayed in rental homes before where the pictures look amazing but when we got there is was nothing like what was in the listing. This house was better than we expected and we had an amazing weekend. Lastly, the people we worked with were so sweet and so attentive. They made the entire process so easy and everything went by so smoothly with no issues! We can't wait to go back and work with Altamira again! Thank you for the great experience!